The Standard Missile-2 (SM-2) is a fleet-area air defense weapon that provides anti-air warfare and limited anti-surface warfare capability against today’s advanced anti-ship missiles and aircraft. With a range of 90 nautical miles and an altitude of 65,000 feet, the SM-2 is an integral part of layered defense that protects naval assets, giving warfighters greater operational flexibility. The SM-2 is a solid propellant-fueled, tail-controlled, surface-to-air missile fired by surface ships. Designed to counter high-speed, high-altitude anti-ship cruise missiles (ASCMs) in an advanced ECM environment, its primary mode of target engagement uses mid-course guidance with radar illumination of the target by the ship for missile homing during the terminal phase. The SM-2 can also be used against surface targets. The currently deployed SM-2 derived from the SM-1 (RIM-GGB), which is still in the fleet. The SM-2 employs an electronic countermeasures-resistant monopulse receiver for semi-active radar terminal guidance and inertial midcourse guidance capable of receiving midcourse command updates from the shipboard fire control system. The SM-2 is launched from the Mk 41 Vertical Launching System (VLS) and the Mk 26 Guided Missile Launching System (GMLS). To counter expanding threat capabilities, the SM-2 continues to evolve and improve in advanced high and low-altitude threat interception. Specifically, the SM-2 is being improved to counter electronic countermeasures (ECM) through modular changes to the missile sections. The Standard Missile was produced in two major types, the SM-1 MR/SM-2 and the SM-2. The SM-1 MR/SM-2 is a medium range surface-to-air missile (i.e. SM-2 Block II, III, IIIA, and IIIB), while the SM-2 is categorized as extended range (i.e. SM-2 Block IV and IVA), allowing it to provide Area Theater Ballistic Missile Defense (TBMD) along with fleet and extended area air defense. It is one of the most reliable in the Navy’s inventory and provides for the critical lower-tier of the layered missile defense infrastructure. Used against missiles, aircraft, and ships, it first came into the fleet more than a decade ago, replacing the Terrier and Tartar missiles on more than 100 Navy ships. The SM-2 (MR) is a medium-range defense weapon equipped byTiconderoga class Aegis cruisers, Arleigh Burke-class Aegis destroyers, California and Virginia class nuclear cruisers, and Kidd class destroyers with NTU conversions. Oliver Hazard Perry-class frigates use the SM-1 MR. Overall, SM-2 Blocks II through IV provide protection against aircraft, anti-ship missiles, and ground targets, expanding the battlespace. The SM-2 has proven itself as a valuable anti-air and TBMD missile, even demonstrating limited ability to strike surface targets. As a result, many U.S. allies such as Australia, Canada, Germany, Japan, the Republic of Korea, the Netherlands, Spain, and Taiwan have adopted the SM-2. SM-2 Block II This variant of the SM-2—along with the SM-2 Block III, IIIA, and IIIB—is a medium range missile that can be fired from Aegis rail launchers, Aegis vertical launch systems, and Tartar rail launchers. Improving on the SM-1, the SM-2 Block II has an improved fuse and focused-blast fragment warhead to provide better kill probability against smaller, harder targets and enhanced propulsion to allow for higher velocities and maneuverability. The Block II also includes a signal processor that provides less vulnerability to ECM. SM-2 Block III This medium range variant of the SM-2 has improved capability against low altitude targets. 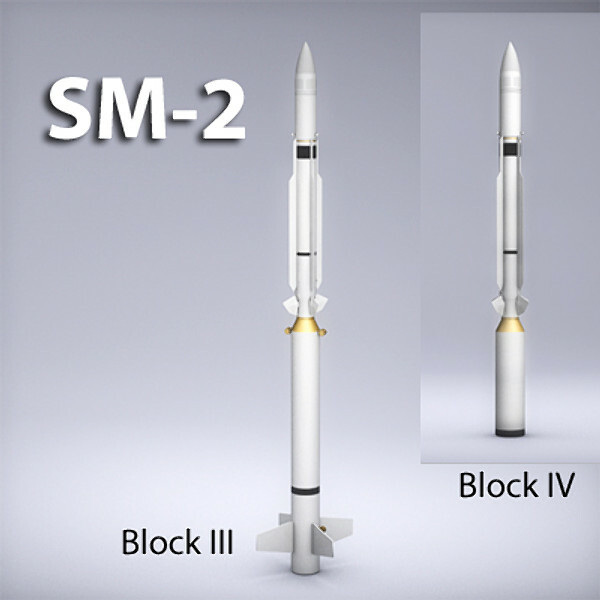 SM-2 Block IIIA The medium range Block IIIA increases SM-2 capabilities at even lower altitudes than the Block III and includes a new warhead that enhances the velocity of warhead fragments moving in the direction of the target. SM-2 Block IIIB The medium range SM-2 Block IIIB incorporates an infrared guidance mode capability developed with the radio frequency semi-active guidance system of the Block IIIA. Called the Missile Homing Improvement Program (MHIP), the dual radio frequency and infrared guidance mode is being incorporated to counter specific proliferating electronic warfare systems in existing aircraft and anti-ship cruise missile threats. SM-2 Block IV This variant of the SM-2—along with the SM-2 Block IVA—is an extended range missile that is launched vertically and has a longer range than the Block II, III, IIIA, and IIIB variants. The Block IV has improved cross-range and higher altitude capability for Aegis vertical launch ships and improved performance against low targets and complex ECM. This improved performance is the result of a thrust-vector controlled booster, a more robust airframe, and guidance and control modifications. 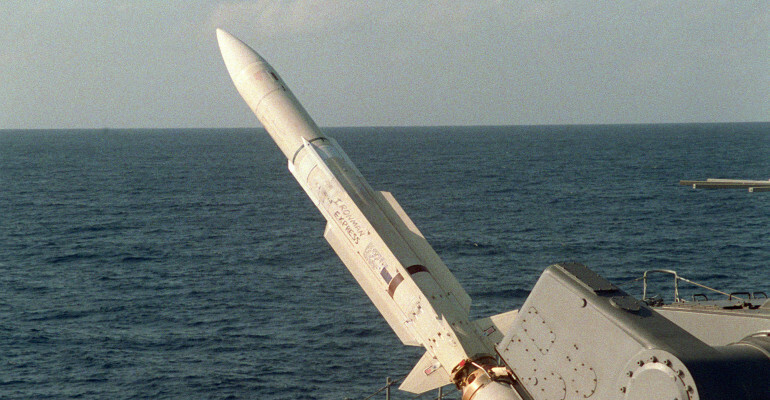 Significantly, the SM-2 Block IV is the Navy’s first missile capable of Area TBMD, having the ability to intercept theater ballistic missiles in their terminal phase of flight. The purpose of the SM-2 Block IV was to enhance U.S. warfare capability by allowing Aegis ships to provide TBMD for ships at sea and ground forces ashore, while also retaining an its anti-air function as well. SM-2 Block IVA (cancelled) To counter theater ballistic missiles, the Block IVA was designed to employ a dual-mode radio frequency/infrared sensor, an upgraded ordnance package, and autopilot control enhancements. However, the program was canceled in 2001 because it was more than 50 percent over budget and two years behind schedule. However, Block IVA improvements to the SM-2 missile design inspired development of the longer-range Standard Missile-3. Starting in 2015, the new Standard Missile-6 (SM-6)—designed to provide fleet air defense against fixed- and rotary-wing aircraft, unmanned aerial vehicles, and land-attack anti-ship cruise missiles in flight—is scheduled to phase out the SM-2 Block IV missile. The SM-6 employs the Standard Missile airframe and propulsion elements, while incorporating the advanced signal processing and guidance control capabilities of the Advanced Medium-Range Air-to-Air Missile (AMRAAM).